Whenever I search for new recipes, the first question I ask is "What season is it?" Any good cook will tell you that fresher is better when it comes to choosing ingredients. So, it's always a good idea to choose ingredients that are in season. In the Spring, I might make something with asparagus or avocados. In the Summer, I might make something with Jersey fresh tomatoes or delicious ripe strawberries. (I do live in the Garden State, after all). And in the Autumn, you just KNOW I'll be making something with apples. They're crisp and juicy, and they're definitely one of my all time favorite foods. Clearly, this recipe needs to be included in the recipe archives. They're quick, simple and comforting. And they're the perfect way to celebrate the season! In a medium bowl, mix together flour, sugar, baking powder, nutmeg and salt. In a separate bowl, beat together egg and milk. Stir milk mixture into flour mixture until smooth. Heat oil to 375F in a deep fryer or heavy bottomed deep pot or skillet. Give the apples a rough chop. You want them to be well chopped but still chunky. Add them to the batter and stir well. Using a 1/4 cup measure, scoop some of the apple batter and gently drop into the hot oil, as one would do when cooking dumplings. Be careful not to splash! When they become golden on one side, flip them in the oil to cook the other side. When they're completely golden and puffed, remove them from the oil. Drain on paper towels and dust with cinnamon sugar while still warm. 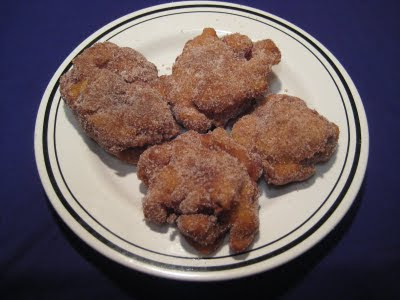 You can use powdered sugar to dust the cooked fritters instead of the cinnamon sugar, or you can mix a little powdered sugar and a splash of apple cider for an easy glaze. This recipe makes about a dozen fritters and is easily doubled if you'd like to make more!